Hiking and spending time outdoor is great, but it’s only a matter of time until you realize you need the right gear to have the best experience. If clothing, boots or camping tent are the things you’d think in the first place, don’t forget about your backpack as it can make the difference between a nice, “back pain free” hiking trip and a bad, full of sores one. Why choose internal frame backpacks? Sitting flush against your back, the internal frame backpacks maintain your overall center of gravity closer to its natural position. As long as you adjust it right from the beginning, a pack like that isn’t going to move around much when you’re on the move. A pack like this typically had a large internal capacity so you may very well store all your belongings inside, well protected. An internal frame backpack is more compact so it’s not difficult to put it in a car for moving. It comes with adjustable shoulder straps so they are easy to customize for the best fit. Look for the backpack that have a durability feel as you don’t want it to break in the middle of your hike. Its aluminum stays should be long, flat, strong enough to provide support, yet not too heavy so they don’t add unnecessary weight to your load. Breathability is very important on a backpack like that so go for one that is made with breathable material and has good ventilation. Most of the internal frame backpacks don’t feature many pockets so don’t expect the best organization. Additionally, check your wallet and be ready to pay the extra buck as an internal frame backpack doesn’t come cheap. 1). 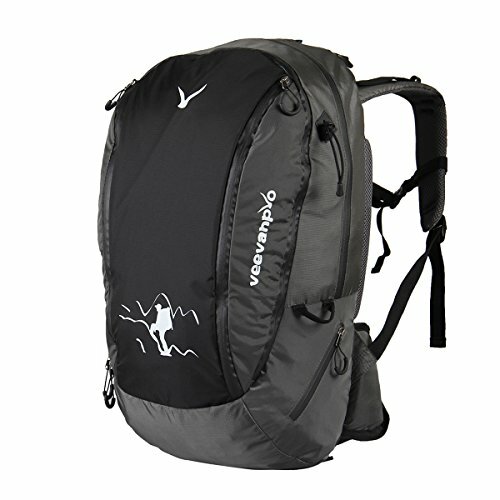 If your mind is set for an internal frame backpack, but you’re not willing to pay too much money on it, put your money at stake with the Veevanpro Internal Frame Hiking Backpack 40L. The backpack gives you a 40L capacity and it surprises us on so many levels. It’s made with lightweight water-resistant nylon materials and its ergonomic design makes you feel better when on the move. The airflow of the padded back panel is good so you feel dry and fresh at the end of the day. The shoulder straps are easy to adjust and well padded, working together with the thicken lumber support for a strain free trip. The backpack also comes with adjustable sternum strap and waist belt so the weight is evenly distributed every time. Additionally, the internal frame is efficient, increasing the stability of the pack while on the go. The organization of the pack isn’t bad at all and the pack comes with 2 front zip pocket, 2 side zip pockets and 2 compartments with several interior pockets for organization. The pack is also hydration read and it may accommodate an 3L water bladder. The backpack comes with bar tack stitching in force points so its tear and rip resistant for a good amount of time. It also comes with dual hiking pole attachment points for a free operation while hiking. Regardless of the minor points, we still think the backpack is a great internal frame option, especially considering its low price. 2). 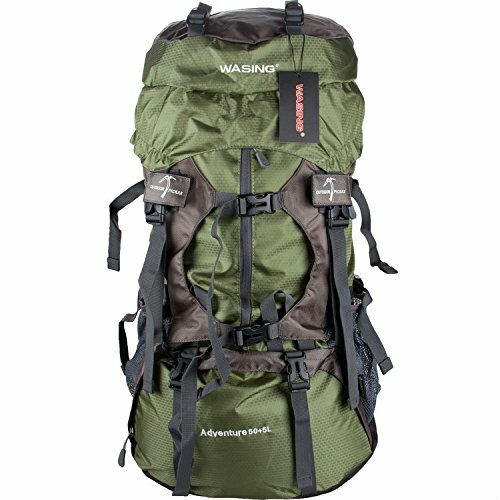 Don’t let the price tag of the WASING 55L Internal Frame Backpack Hiking Backpacking Pack mislead you as, for the money you pay, the backpack is a great surprise on so many levels. The backpack isn’t the largest out there, but it sure comes with an impressive list of features to consider. 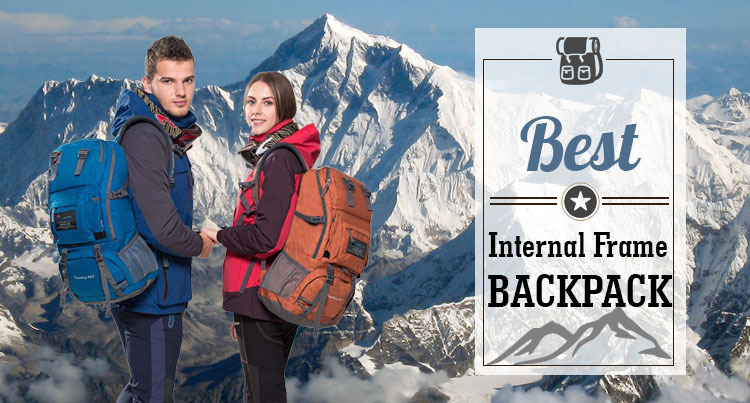 The backpack comes with an extension collar with two drawstrings on the top so you may expand it and get a bigger capacity for the main compartment, 5 liters bigger. You get plenty of space to organize your personals and the backpack also features one front pocket, two mesh bottle pouches, and a rain cover compartment. It comes with its own rain cover, so no worries on a rainy day. Now that we’re here, I’s good to know the backpack is made with water resistant material so your personals are going to be protected on a light rain. The backpack comes with sternum strap with emergency whistle buckle and a hip belt that is easy to adjust. Additionally, it features pockets so you win more space for storing the smaller items. The backpack also features a front sleeping bag compartment with divider Bearing System, for more efficiency. The comfort is good since the backpack features padding on the shoulder straps, hip belt, waist strap, and the upper back. The ventilation is efficient and you don’t end up all sweaty after a day hike. The attention to details is great and the backpack also features trekking pole attachment and bottom loops for ice axe or some hiking poles. Both of the shoulder straps have D-shape hook so you may attach some small items also. The zippers are also good quality, made of SBS material. Despite its many features, the pack is lightweight and comfy. It’s well stitched and it comes with compression straps for a good control over your load. All in all, considering how lightweight, well made and efficient the backpack is, we’d say it’s quite a big bang for your buck. 3). 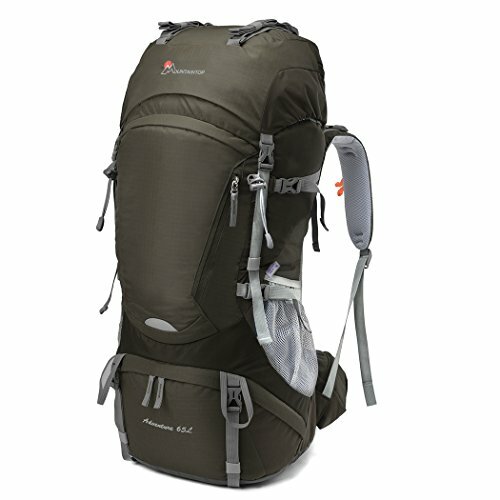 Reliable and well made, the Mountaintop 65L Internal Frame Backpack Hiking Backpack with Rain Cover-5822III manages to be a reliable choice, especially if you’re not willing to pay the extra buck for a backpack. Made with rip stop nylon fabric, the backpack brings many good things to the table. It comes with its own rain cover in a designated small zip pocket on the bottom part. It also features a compartment for your sleeping bag and an internal divider in that compartment so it’s easy for you to get the sleeping bag without having to go through all the other things inside. The main compartment is roomy and easy to access, whereas the hydration sleeves is functional and easy to use. the top of the pack is expandable and the lid features two more zippered pockets, easy to adjust. Now that we talk about the pockets, the backpack includes also 2 zip pockets on the waist belt and one front zip pockets. The backpack comes with well-padded shoulder straps and waist strap, whereas the “Super Carry” suspension system lets you shift the weight of the pack up or down, depending on your height. You can get control over your load using the compression straps of the pack. The YKK zippers open and close nice and smooth every time and so are the buckles. The backpack seems to be well made and has a great weight distribution. Adjustable, comfortable and able to organize so well your items, the backpack is worth to try anytime. 4). 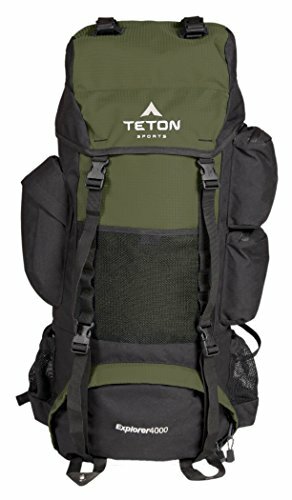 No matter if you’re a man or a woman looking for a rugged and tough internal frame backpack, play it safe with a popular choice out there, the Teton Sports Explorer 4000 Internal Frame Backpack; Great Backpacking Gear; Backpack for Men and Women. The capacity of the backpack is an impressive 4,000 cu. In. 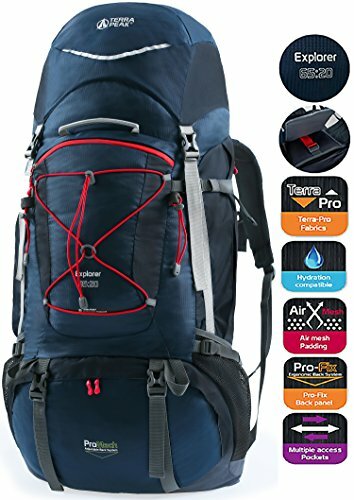 (65L) so it’s going to be a good option if you’re going on a multiple day’s hike trip. Unlike many internal frame backpacks, this one isn’t bad at all when it comes to organizing your personals. As a matter of fact, it features pass through side pockets, three mesh pouches for attaching various gear with upper and lower gear loops, and six pockets for all of your items. The main compartment is large and it’s easy for you to control the volume of your load with its compression straps. Another great feature of the backpack is that it comes hydration ready and has plenty of space for a 3-L water bladder. The breathability isn’t an issues with this backpack and the open-cell foam lumbar pad and molded channels improve your comfort, keeping you nice and dry all day long. The comfort is also good and the backpack features thick lumber and upper back pads. The torso part is easy to adjust, whereas the shoulder and hip straps come with breathable mesh and tensioners. The backpack has a durability feel to it and it’s made with 6000D sq. Rip stop fabric combined with 600D Oxford canvas shell. On top of everything else, the backpack comes with a large sleeping compartment and a rainfly. For its build, durability and reliability, the backpack is still a safe choice, whenever in need. 5). The more you’re willing to pay for your backpack, the more you may expect when it comes to its build and features. It’s the case of the TERRA PEAK Adjustable Hiking Backpack 55L/65L/85L+20L for Men Women that is worth every single penny, no matter how you put it. The backpack is fully adjustable and it’s designed for improved comfort and versatility. Its internal frame system is adjustable so the risk for some back pain or strain is minimal. The pack features padded and breathable mesh back panel and shoulder straps for more comfort as you go. The sternum strap is functional and comes with an SBS buckle, easy to adjust up and down. The capacity is an impressive 85L and you may add the extra 20L of storage under hood and inside pockets. You get good control over your load thanks to the dual compression straps, and a good organization of your personals thanks to the deep butterfly expansion pockets on the side and the mesh side pockets. There are several tool attachment points to consider: the elastic bungee cord system, the trekking pole attachment and the 8 compression straps. The elastic bands and the Hypalon loop are great to use for keeping the extra straps tight, without tangling on the front. The pack also comes with a carabineer keychain clip. The backpack is also hydration system compatible and the bladder compartment has hydration access on the side. The water bladder sleeve is placed in the main compartment. The Velcro loop inside the main compartment helps you better fix the water bladder. Another important feature of the pack is its waterproofness as it comes with a rain cover build in the hood. The pack is also outer treated with water-repellent coating, in case of a light rain. Despite the minor issues, for the impressive list of good things, the backpack isn’t a deal to skip on.